The Dana House, which was designed by the architect Frank Lloyd Wright, is located in the heart of Springfield's historical district. 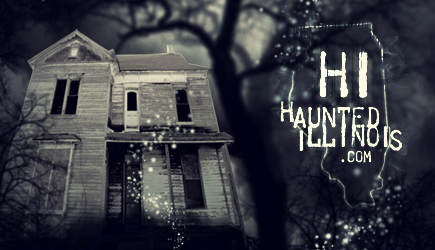 It was built for one of Springfield's leading citizens, Mrs. Susan Lawrence Dana, and while the "official" word on the place states that it is not haunted, strange things have occurred here. In addition, the house provides the city of Springfield with a link to the history of the supernatural and a connection to those who communicated with the dead. The house itself may not provide a link between this world and the next, but it cannot be denied that Susan Lawrence Dana certainly believed that it did! The Dana House was started in 1902 and upon its completion became a symbol of culture and high society in the city. Following in the wake of a series of tragic losses by Susan Lawrence Dana. The house managed to provide her with a distraction and a purpose in life. It also was a memorial to the man whose money created the place, her father, RD Lawrence. Rheuna Drake Lawrence was a successful businessman and contractor who came to Springfield in 1856. A few years later, he married Mary Agnes Maxcy and they had a child that same year that lived for only a short time. A second child was born in October 1862 and she was named Sue C. Lawrence. (Her middle initial later transformed her name into "Susie"). The Lawrence family thrived in Springfield after the Civil War and invested heavily in expanding rail service to the city. They built a prominent Italianate villa at the corner of Fourth and Wright Streets and by the time of Susan's wedding in 1883, RD Lawrence was a very wealthy man. On December 4 of that year, Susie Lawrence married Edwin Ward Dana, a real estate investor from Lincoln, Illinois. After the wedding, the newlyweds moved to Minneapolis, where Edwin went into business on his own. Unfortunately, he did not fare well and they moved to Chicago in 1893, where he made himself the president of the newly formed Western Business Agency. He claimed the company had branches in nine western cities, but within a year, it had all fallen apart. Disgraced, he had no choice but to borrow money from his father-in-law and finally, by late 1894, he and Susie were back in Springfield. Lawrence quickly put Edwin to work, sending him to Oregon to manage some mines that he owned there. One of the mines he was working in closed down and he moved on to Leland, Oregon. Susie stayed behind in the town of Grant's Pass, where living conditions were better. Within a month, she was on her way back to Illinois, this time bringing Edwin's body with her. He had been hoisting ore when a harness snapped, causing a pulley arm to spin in reverse. It struck him in the chest and killed him. Susie was crushed. During her short marriage, she had buried not only her husband, but also two infants that she had been unable to carry to term. Within a few years, she would also bury her father as well. On February 17, 1901, RD Lawrence died in his Springfield home. His death struck a tragic blow to the family but also left Susie with freedom and a financial windfall. As the new head of the household, Susie decided to build a grand new home for the family, which now consisted of her, her mother, her grandmother (who would pass away in August 1902) and her cousin, Flora Lawrence. In her search for a prestigious architect, she looked away from Springfield and toward the more metropolitan city of Chicago. She found the vitality she was looking for in a young designer who was just starting to make a name for himself, Frank Lloyd Wright. Wright was born in 1867 and is considered today one of America's most famous architects. He was an innovative designer and far ahead of his time. 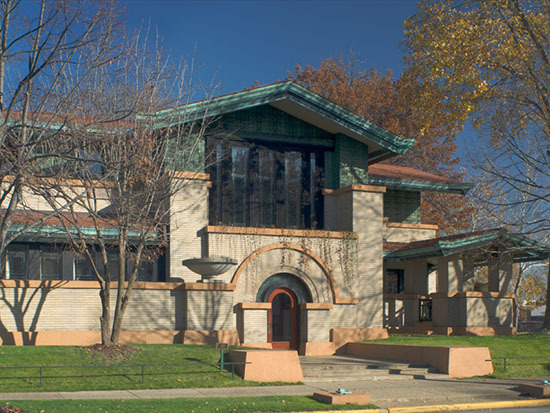 He was the founder of the Prairie School of architecture, of which the Dana house is a prime example. The style was created around 1900 when most of America was living in box-shaped Victorian homes but it has remained popular in the "ranch" style home of today. Wright was raised and educated in Wisconsin and spent his childhood on his mother's family farm. It was here that he learned to love nature and where he learned to combine architecture with the natural world. Wright moved to Chicago and Oak Park in the 1880's, studying under Louis Sullivan, before opening his own design firm in 1893. By the end of the century, his studio in Oak Park had become very well known in Chicago social circles. Wright and his staff were intrigued by the idea that Susie Lawrence brought to their studio. The original intention had been to incorporate the old villa into the new house and provide a home and gallery for living and entertainment. In the end, only one room of the original house was used. Wright planned a Prairie House, which he believed was the home of the future. These houses are long and horizontally shaped with open spaces inside. They are also designed with furniture and windows that will not obstruct the interior in any way. Construction was started in 1902 and would take two years to complete. Wright designed every aspect of the house from the furniture to the lights and design of the windows. In 1905, he would also design the Lawrence Memorial Library, which was connected to the house by way of a raised walkway. The Dana house was the first of Wright's designs to contain two-story rooms like the gallery, the dining room and the hall. The gallery was a reception room for entertaining and was connected by a covered passed that doubled as a conservatory. The house itself is simply amazing. The principal common rooms were located on the main floor, while the bedrooms were upstairs. The staircases were all hidden, so as not to distract from the home's design and every room featured built-ins and specially constructed furniture. The interior walls were all cream- colored and crossed with fabulous woodwork. The library was constructed with built-in bookcases with glass fronts and beneath the walkway to the gallery were a billiards room and a bowling alley. Needless to say, there was not another house like it in Springfield, or anywhere else for that matter. The house was completed in 1904 and Susan, as she began calling herself the year before, was exhausted, yet excited, about the prospect of the new house. Doubts began to creep in that summer and she began to worry about the house and money that she was spending to build it. To soothe her fears, she decided to try and get in touch with her dead father and to seek his approval, or at least his advice, on her affairs. She contacted a spirit medium who put her in touch with Lawrence and (surprise!) he expressed his delight with the new house. This was when Susan began to realize the endless possibilities of Spiritualism and contact with the other side. While many of us many chuckle at these beliefs today, in those times, she was far from alone. In the early part of the 1900's, the Spiritualist movement was a prominent force in America. Founded more than 50 years before, Spiritualism was based on the idea of life after death and that communication between the living and the dead can, and does, take place. Messages that came from the spirit world were passed along through a "medium", who could speak with the dead while in a trance and often produced messages and writings that allegedly came from the spirits. Other mediums claimed to be able to produce physical phenomena while in a trance state, including knockings, lights, sounds, music, ghostly voices and even spirit materializations. Hundreds of these mediums flourished during the heyday of Spiritualism. Most of them practiced their craft during "s�ances". During these sittings, all sorts of strange events could take place from table lifting to ghosts appearing and speaking to loved ones left behind. The s�ances always took place in dark or dimly lighted rooms because darkness took away all of the distractions and made it easier for the spirits to manifest. Of course, skeptics offered a simpler explanation for the darkness... it concealed the practice of fraud! Like all branches of the occult, Spiritualism was not immune to deceptive practices. Over and over throughout the history of the movement, many people who were looking for miracles were taken advantage of and deceived. But not all of the phenomena was so easy to explain away! Because of this, the riddle of Spiritualism remains unsolved today, depending of course, on your point of view. Regardless of whether or not it was all genuine, Susan Lawrence Dana was no eccentric. Spiritualism was a widely held and regarded belief for many years and it leaders included some of the most respected and influential people of the 1800's and early 1900's. Some of the believers included Sir Arthur Conan Doyle, Sir William Barrett, Elizabeth Barrett Browning, James Fenimore Cooper, Washington Irving, Henry Longfellow, James Greenleaf Whittier and many others. Susan began hosting lavish parties during the holiday season of 1904 and followed the initial affairs with housewarmings for the Women's Club, parties for local children and residents of orphanages, dinners for residents of old-age homes and a gala for the families of the workers who built the house. The busy holiday season took its toll on Susan and her mother. They traveled to the Caribbean that winter and relaxed in the Bahamas, Jacksonville and Palm Beach, Florida. They were on a train to Savannah, Georgia when Mrs. Lawrence suffered a heart attack and died. Susan's life was now in chaos and seemed to be spinning out of control. She had now lost everyone she had ever loved. In desperation, she turned to the spirit world. S�ances began to be held in her Springfield home on a regular basis and many of the guests were the elite of local society. Susan asked the spirits about many things, including asking for advice on financial matters and personal affairs. Her most desperate questions involved money because she never seemed to be able to grasp just how to handle it. She was already spending much more than her investments could possibly make. It was recorded in 1915 that she received about $10,000 income from some of her father's rental properties. Unfortunately, she had borrowed $132,000 for expenditures. In spite of this, she continued to host expensive parties, sometimes scheduling several events on the same day. She also kept a full staff of servants employed, despite the fact that only she and her cousin Flora lived in the house. In March 1912, Susan secretly married a concert singer from Denmark named Jorgen Constantin Dahl. This fueled the local gossip mill, as the young man was half Susan's age. Tragically, he died just one year later, leaving Susan once again alone. In 1915, she married again, this time to Charles Gehrmann, a native of Springfield. There is little indication of whether or not this marriage was happy as Susan continued with her many activities. Eventually, she and Gehrmann separated and she divorced him in 1930. By this time, Susan was using the name Susan Lawrence Dana Joergen-Dahl Gehrmann, but regardless of what she called herself, she lived however she pleased. Susan became an advocate of women's rights and actively participated in the suffrage movement. In 1923, she was named as the Illinois chairman for the National Women's Party, a group working for the woman's right to vote. Susan also continued her pursuit of the unknown. She collected a huge library of books on the occult, spirit contact, psychic healing and metaphysics. Her circle of other Springfield knowledge seekers often gathered in her home and called themselves the "Springfield Society of Applied Psychology". They later became the "Lawrence Metaphysical Center" in 1924, and three years later, in 1927, moved their meetings to a building downtown. This move was a quiet signal that Susan was now living in reduced circumstances. Her money had finally run out and she had closed down the grand house. She and Flora, who was gravely ill, moved into the Lawrence cottage, located across the railroad tracks from the house. Susan cared for Flora and took her meals at a boarding house across the street. Flora died in 1928, leaving Susan completely alone. She was now in poor health and lonely. She consulted mediums, as she had always done, and at the request of the spirits, changed her name to Susan Z. Lawrence. Susan also had friends who still cared for her and she kept in touch with Frank Lloyd Wright over the years. Sadly, their final meeting was canceled when Susan fell down the steps of the cottage and was injured. She wrote him a letter that stated a fraternal organization was thinking of buying the house. That sale never materialized. By 1939, Susan's health was badly in decline and friends tried to get her to appoint a conservator for her estate. They had no success. Her financial affairs, always troubled, were now beyond repair. The Marine Bank in Springfield refused to foreclose on her however, thanks to their love for Susan and respect for her father. Regardless, it was no secret that she owed them more than $167,000, they simply didn't talk about it. No one wanted to embarrass the woman who had been so generous to the people of the city. In May 1942, Susan entered St. John's Hospital and would never leave it. No time was wasted and that same afternoon, a court petition was filed that declared Susan incompetent and unable to handle her affairs. The court appointed attorney Earl Bice as conservator of the estate and a cousin from Chicago, Farnetta Radcliffe, as caretaker of Susan herself. An inventory showed that Susan, despite her debts and mortgages, had faithfully kept all of her father's properties intact, including the Springfield buildings, the house, and even the abandoned mines in Colorado and Oregon. She also had an enormous amount of personal property that was estimated in value to around $75,000. The inventory list was 178 pages long, but foolishly handled. Things were given ridiculously low values by people who obviously had no idea what they were doing, appraising Frank Lloyd Wright furniture pieces at $10 and rare Japanese prints at $2.50. Obviously, the inventory was far off from the actual value of the estate. An auction was held in July 1943 and ran for six days. The sale drew tourists and curiosity-seekers and the newspapers wrote of Susan's eccentric belongings. Sadly, her wonderful belongings, including rare artwork, photographic equipment, and incredible book collection, brought little money. The house itself was treated as an eyesore and the appraiser deemed it "undesirable". He stated that if anyone could be found to buy it, it would sell for less than $20,000. Unfortunately, he was right. Charles C. Thomas, a book publisher, purchased the house later that same year for $17,500. The good news was that Thomas was familiar with Wright's work and he wrote the architect in 1943 and assured him the house was in good hands. The house was turned into the headquarters for Thomas Publishing Co. and the roof, walls and gutters were repaired before the company moved into the house in 1944. Susan Lawrence passed away on February 20, 1946. It was reported that she was lucid and aware of her surroundings. It is unknown if she was ever told about the sale of her wonderful house and cherished books and belongings. Charles Thomas died in August 1968 but the company stayed on in the house for another ten years. They had saved the house from ruin, but when they abandoned it in 1981, the place was badly in need of restoration. A chain-link fence surrounded the front terrace, the garden pool was gone, the bowling alley had been cut into tops for tables, the sand-finished walls had been painted, plus, collectors and museum curators had bought up most of the original Wright pieces that had remained in the house. Luckily, the governor of Illinois at that time, James R. Thompson, was an antique lover and fan of Frank Lloyd Wright. He supported a bill to purchase the house and to begin its restoration. The state took possession of the place in 1981 and began a three-year project to restore it to its condition in 1910. In addition to the work done on the house, much of the original furniture was recovered as well. But what about the ghosts? Although hotly denied in "official" statements, there have been many reports of strange occurrences in the house over the years. Springfield newspapers tell of strange sounds, like footsteps and hands clapping, that have been heard in the otherwise empty building. On one occasion (which just happened to be the anniversary of Susan Lawrence Dana's death), a light sconce suddenly flew off wall without explanation. A staff member in the story was quoted as saying: "It's a standing joke among us, that Susan still walks the halls, watching over the house that she loved." Haunted or not, there is no question that the Dana House still stands today a tribute to both the architect Frank Lloyd Wright and the creator of the estate, Susan Lawrence Dana, who remains a patron to the haunted history of Central Illinois.